How to measure and enter sizes. . Frames are normally made with a 1/8" allowance in the frame. A 16x20 frame will actually be 16 1/8" x 20 1/8". Take this allowance into consideration when ordering your acrylic. For the frame just mentioned you would order a 16x20 size. Enter your sizes below in decimal fractions (16.25, 14.3875, etc). I will cut acrylic to 1/16" accuracy. There is a list of decimal fractions listed below. I sell custom cut Acrylic for your other framing needs. The 'How to Choose' link on the left menu has the specifications for the Acrylic I sell. I buy Acrylic in 4' x 8' sheets and cut it using panel and table saws with special no-melt Acrylic blades for a very factory smooth edge. I use Tenryo Pro Series for Plastic blades exclusively to cut your acrylic. I can cut and ship most any size of Acrylic, but oversize charges may apply on sizes greater than 24" x 30". Please call or write if you require larger sizes. The shopping cart shiping charges are based on normal sizes so the rates shown are not applicable if you need oversized pieces. Shipping weight is about 1 pound per square foot. The image on the left is a piece of acrylic that has been cut by me using the proper equipment. Note the smooth edges. The image on the right was cut by someone else using improper equipment. This badly cut acrylic may also have chips that may work loose over time and be visible in the frame. That won't happen with properly cut acrylic. Note: While my acrylic is great for your picture framing needs, it shouldn't be used in applications where the edges will show such as sandwich frames. 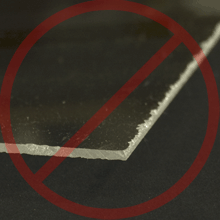 Your acrylic will have nicely cut edges but may not be as smooth as required for a sandwich frame or other applications where the edges will show. Acrylic Spec Sheets The following links are to manufacturer spec sheets for acrylic.